In 1959 Efstratios Tériade, the publisher of the vastly influential 20th century art review Verve, approached Chagall suggesting to him that he undertake a new project, illustration of the prose romance Daphnis & Chloe, the first known pastoral romance written by the 2nd century Greek author Longus. Idyllic in nature, the poem tells the improbable but charming story of the love of Daphnis, a shepherd, the son of Hermes and a nymph (who was revered as the inventor of pastoral music), and the shepherdess Chloe. The idea of reviving and illustrating this story, which had been widely popular primarily in France and England throughout the 17th and 18th centuries, is one that greatly appealed to Chagall. He began his preparation by making two trips to Greece, traveling there to absorb the inspiration of the Greek landscape. Over the course of three years Chagall worked on this project creating images which glow with an almost ecstatic color in which he exploits the whole range of tones and textures of lithography. In Daphnis & Chloe Chagall succeeded in transforming a personal dream into a universal Eden where the figures seem to float in an atmosphere of infinite happiness whose warmth is all- pervasive. The forty-two lithographs which comprise the album have since their release been heralded as the very greatest achievement of Chagall’s entire graphic oeuvre. 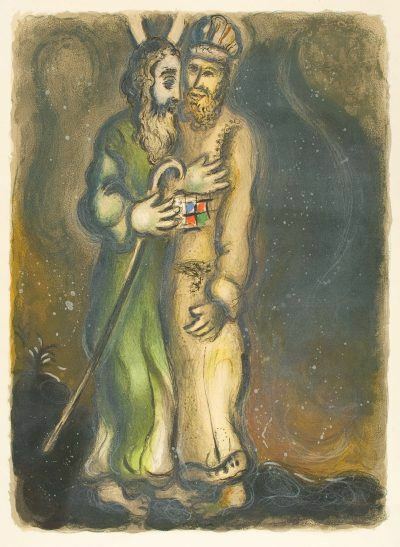 In the introduction to the set in the Mourlot catalogue raisonné it is referred to as “the most important graphic work that Marc Chagall has created thus far.” It remains today the pinnacle of his work in this medium, the shimmering lithographs continue to be revered as amongst the master prints of the mid-twentieth century.